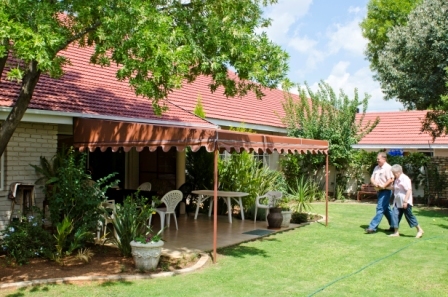 EVENTIDE HOME is situated in beautiful garden surroundings in the peaceful suburb of Ellaton in Klerksdorp. At EVENTIDE our aim is to provide a caring and loving atmosphere for the elderly. Our friendly and helpful employees help to achieve this standard. It is a small and intimate home with accommodation for 29 residents in single and double rooms with private bathrooms and patios. The TV lounge is available for all our residents. We bring quality to daily living and offer our residents regular entertainment such as playing card games and board games. Outings to musical shows and concerts and social teas are also arranged. Church services and devotions are held regularly. Our residents are given three balanced meals, prepared by our food service manager, and served daily, as well as regular tea times. To place your name on the waiting list for accommodation, please complete the accommodation application form which can be downloaded below.